British motorcycle manufacturer Triumph has been appointed as the official engine supplier to the FIM Moto2 World Championship from the 2019 season onwards. The company has signed a three-year contract with Dorna Sports, the commercial rights holder of MotoGP. As per the contract, Triumph will supply race-spec 765cc engines that powers the 2017 Triumph Street Triple. The Moto2 spec Triumph engines will feature a long list of modifications. The cylinder head has been modified with revised intake and exhaust ports. The valve system uses Titanium valves with stiffer valve springs to cope with higher engine rpms. In order to reduce inertia, the Moto2 spec engine also features a low output race kit alternator. The tuneable, race developed slipper clutch is also tuned to perform at the level that's desired in a championship like Moto 2. A race specific ECU is also being developed with Magneti Marelli. The gearing has also been revised with a relatively taller 1st gear ratio, which should help reduce wheelspin and the occurrence of wheelies as the riders launch the bikes off the starting grid. The engine has been developed by test rider Julian Simon, the 2009, 125cc World Champion, Moto2 championship runner-up and an experienced Moto2 rider. He stated that the engine feels strong, particularly in the midrange and feel between the throttle and the rear tyre is pretty direct. 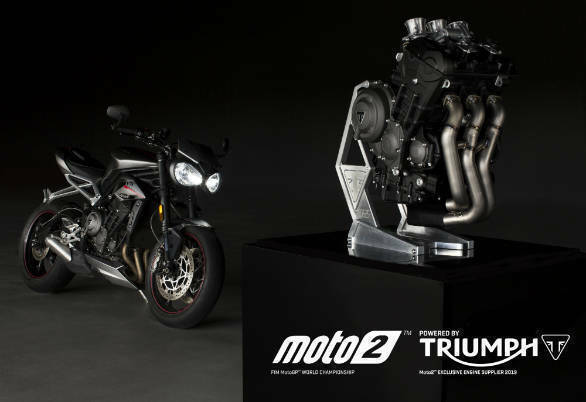 Speaking about the new association with Dorna and Moto2, Paul Stroud, CCO, Triumph Motorcycles said that it this is a significant moment and a new chapter in Triumph's 110-year old racing history that builds on the TT and Supersports race winning triple-cylinder engines. Dorna's CEO, Carmelo Ezpeleta added that Triumph's triple cylinder engines are known for their linear, power delivery and the success that they've achieved which makes Triumph the perfect choice for the sole supplier of engines for the Moto2 Championship. The year 2019 also marks a new era of Moto2, which is regarded as the ultimate step up to the MotoGP World Championship. Vimal Sumbly, the MD of Triumph Motorcycles India has stated that Triumph's association with Moto2 will boost the brand's awareness as well as give riders a chance to own a piece of Moto2 technology. The 2017 Triumph Street Triple is set to go on sale in India this year. You can read our first drive review here.